I am no desert-making expert, but this, seems to me, has a shot of being the best easy chocolate brownie recipe around - it's so simple and so delicious, it's earned me serious kitchen kudos from everyone I've served them to! I actually got the recipe from a Swiss German cookbook (Betti Bossi brand I think), however it's billed as an American brownie recipe. Whatever, all I know is they're damn moreish. Step 1 - Chop then melt the butter in a small pan on a medium heat, being careful not to burn it. Step 2 - Break up the chocolate and add this in, melting and stirring until completely melted and smooth. - Then remove the pan and place somewhere to cool for 5 minutes (I use the windowsill outside). Step 3 - Add the sugar, vanilla sugar and salt into a mixing bowl. - Then break and whiz the eggs in a cup using a fork, and pour the egg mixture into the mixing bowl. - Use a whisk or electric hand mixer to blend all these together. pour in all the chocolate sauce and mix some more. Step 5 - Finally, you will keep blending while pouring in the flour - to thicken up the mixture. - When done, do the same with the nuts and when all well blended together we're ready to cook! Step 6 - Coat a baking dish (ours is a 30cm or 12"-long rectangle shape) and coat with oven-proof paper. - Pour in the brownie mixture and use a spoon to even it out. - Cook at 180C/350F for 20-25 minutes (when you can insert a toothpick and pull it out clean, it's ready). - Remove from oven and leave to stand/cool for at least 15 mins before chopping into chunks. Angie - the next time I make these I'll be sure to send you a pic in all their glory! 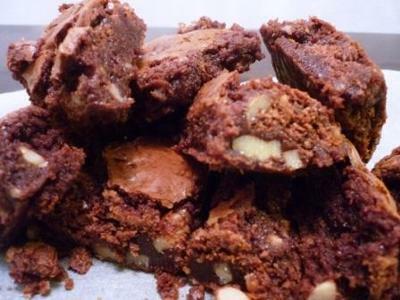 Thanks so much for stopping by and adding your best easy chocolate brownie recipe. :~) Sounds so yummy! I'd love the photo if/when you get around to it. A good picture is enough to push someone over the edge of temptation to actually making a recipe. Myself included. Your pasta site is fantastic, too. I'm sure my visitors will enjoy popping over for some dinner recipes once they've got dessert sorted!